After reading ultramarathoner Scott Jurek’s memoir Eat and Run, the Gent suggested we experiment with mesquite flour. Mesquite flour is made from the dried, ground pods of the mesquite tree. Its fragrant, slightly nutty flavor has a sweetness reminiscent of molasses. One tablespoon of mesquite flour contains 2g natural sugars, 1g protein, and a whopping 4g of fiber, not to mention a cocktail of essential nutrients. 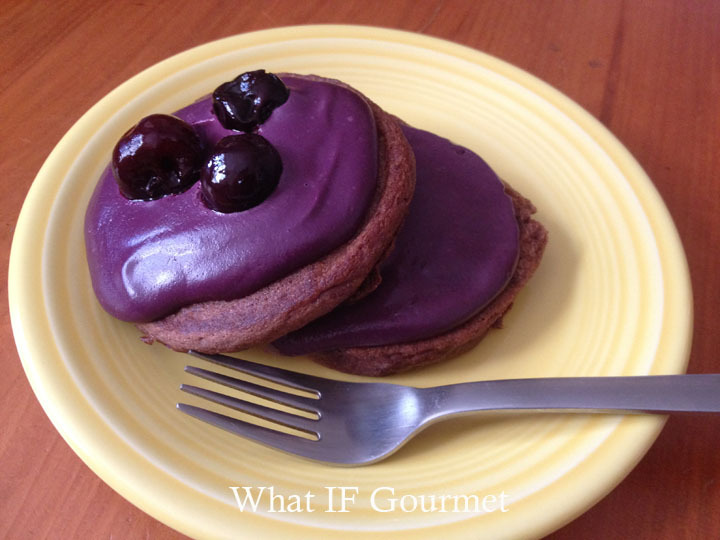 We’ve been having fun experimenting with it in smoothies, cookie dough balls, and gluten-free dinner rolls, but so far my favorite way to use it is in these chocolatey, gluten-free pancakes. 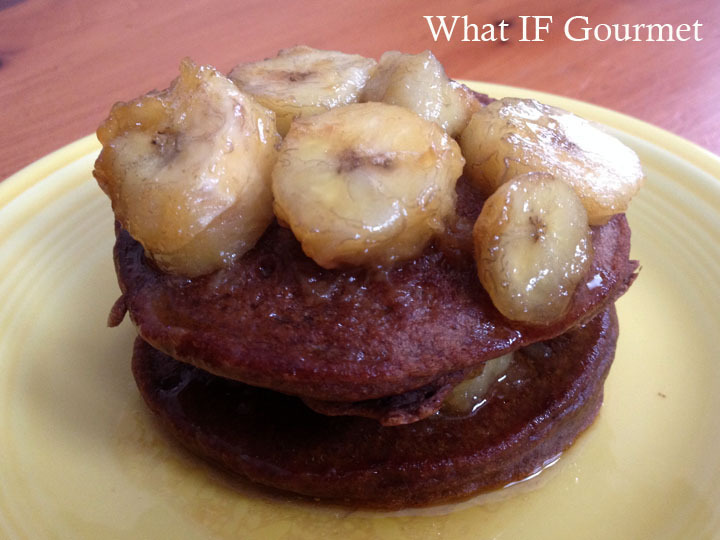 Mesquite & cocoa pancakes with peanut butter and rum bananas. The mesquite powder adds just the right hint of sweetness to these gluten-free pancakes without any additional sweetener. The pancakes are delicious topped with cooked bananas or red berries, or sandwiched with peanut butter or coconut manna. Don’t be put off by the apple cider vinegar in the recipe; you won’t taste it. It’s there to react with the baking powder to enhance the fluffiness of these gluten-free goodies, and also to brighten up the perception of the chocolate flavor. 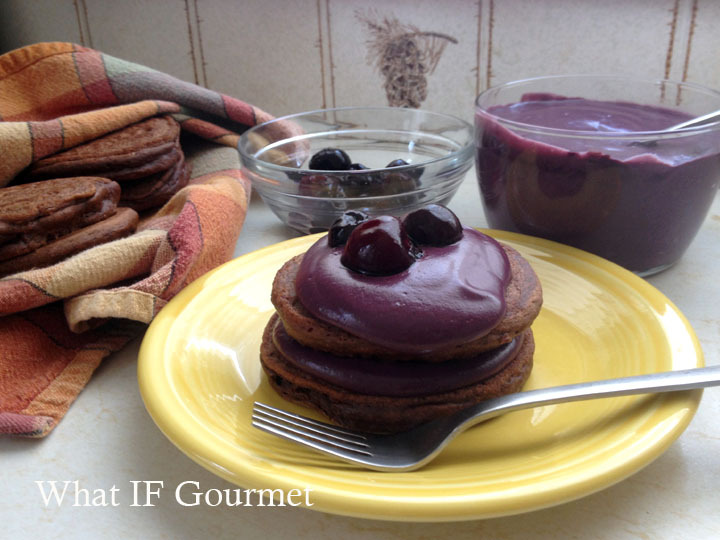 Mesquite & cocoa pancakes with cherry cashew creme and dark, sweet cherries. Whisk together the dry ingredients in a medium-sized bowl. In a separate bowl, whisk together the eggs, almond milk, and vinegar. Add the wet ingredients to the dry all at once, and whisk quickly until smooth. Melt a little bit of coconut oil on a hot griddle over medium-low heat, and cook pancakes until they are bubbly and slightly dry at the edges. Flip and cook another 30 to 60 seconds. Makes about one dozen 3 to 4-inch pancakes. 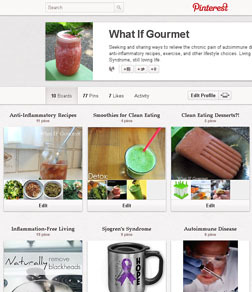 This entry was posted in Anti-Inflammatory Ingredients, berries, Breakfast, coconut oil (virgin/ unrefined), Dairy-free, dark chocolate (70% cocoa or more), Desserts, fruit, Gluten-free, legumes, Nut-free, Recipes, Snacks, Vegetarian. Bookmark the permalink.